(Office of Her Majesty, Press Department – Jeddah) During a special address at the Jeddah Economic Forum (JEF), Her Majesty Queen Rania Al-Abdullah urged the global community to plant the seeds of acceptance, dialogue and peace for future generations. "The obligation to plant well for posterity is a common thread linking humanity," said Queen Rania. "Citizens of both East and West must be willing to sit down with and listen to the other – and each of us must be accountable for what that dialogue reveals," she asserted. In its eighth year, the forum, widely recognized as the premier business gathering of the Middle East, was attended by a host of high-profile regional and global personalities, including the Prime Minister of Turkey, His Excellency Recep Tayyip Erdogan and the Deputy Prime Minister of Malaysia, the Honorable Dato’ Sri Mohd Najib Tun Abdul Razak, amongst others. Over the last eight years, JEF has addressed issues of concern on the international arena, hosting regional and international leaders and influential figures, including His Royal Highness Prince Al-Waleed bin Talal, Arab League Secretary-General Amr Mousa, former US President Bill Clinton, former British Prime Minister, John Major, former German Chancellor, Gerhard Schroeder, and former US Secretary of State, Madeleine Albright. Queen Rania’s message comes at a time when worldwide polls are released outlining the perception of a growing rift between East and West. "At a time when technology has shrunk the world into a village," she said, "we find ourselves distrustful and divided. We prejudge others on the basis of labels instead of thorough personal experience, and we dehumanize those around us." Her Majesty spoke of the stereotypes that target Arabs and Muslims, noting that the onus is on the regional community to examine and confront the reasons behind those stereotypes: "Muslims cannot complain that we are negatively stereotyped by the West, unless we ourselves address some of the factors behind those perceptions. We are right to deplore Islamophobia, and the branding of Muslims as terrorists, but we must face up to the horrible truth that many of the worst terrorist attacks in recent years have been committed by people who claim to be acting in the name of Islam,” she said, adding: "We are right to denounce Israeli violence against civilians in Palestine and Lebanon. We are right to decry abuses at Guantanamo and Abu Ghraib. But we have to stand in the face of the sectarian violence that is escalating in some of our countries.” Queen Rania went on to say: "We are right to question Western governments when their actions only make it easier for radicals to recruit new followers. But our moral authority depends on our willingness to reject the voices of extremism and violence in our midst.” She was quick to point out, however, that such an appeal would be stronger if Arabs and Muslims around the world are united: "…but our appeal would be more compelling if we were not divided ourselves. It is hard to insist the West should embrace us as neighbors in the global village, when across the Muslim world we are at war with ourselves, brother against brother – in Iraq, Palestine, Lebanon and Afghanistan," she affirmed. The Queen's message of urgency was echoed in her tone. "I feel that there is something crucially missing," she said, "I suggest we get back to basics because the need for global healing is all too obvious." The basics that Her Majesty was referring to are humanity's healing principles, which she called "the language of the conscience and the speech of the heart, the values of acceptance, love, respect and peace." 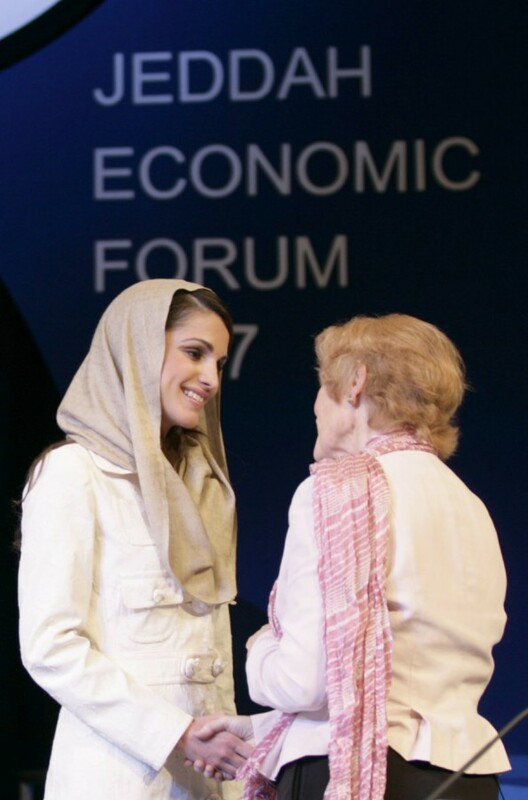 Queen Rania referred to the disposition of dialogue in the history of the region, as a guiding example for the Middle East today. "In Islam's golden Age, Arab civilization was open to the wisdom of others. Our ancestors welcomed new ideas from foreign lands, which they combined with their own expertise to push the boundaries of knowledge even farther." Change for the better, according to Her Majesty, comes from the people and by the people: "More of us need to do more for us because change… takes people who are bold enough to act, people who know that good investments take time, people with vision and drive. Government officials have a crucial role to play- but they cannot do it alone. They need the energy, creativity, and commitment of people like you." Queen Rania concluded her address on a hopeful note: "Together, we…can start planting the seeds of…an oasis in the desert, a place where all our children, from East and West, can find acceptance, love, respect, and peace," she said. The three-day forum is titled 'Economic Reform: Flourishing Grounds and Expanding Horizons', and will address strategies for economic reform, social responsibility, and privatization, amongst other issues. Her Majesty also met with Turkish Prime Minister, Recep Tayyip Erdogan, on the sidelines of the forum, where they discussed issues of mutual interest.